I’m chairing what may be the first ever marketing-oriented session at the annual Flash Memory Summit in August 2013. A lively panel of experts, editors, and analysts will be discussing product differentiation in a growth market in a session called: Differentiate or Die – Marketing Flash-Based Storage Systems. This post is the 3 part of a primer on product positioning. It highlights a dilemma for CEOs, CTOs, and marketers who position their products as part of a new technology solution. It’s very common to position an enterprise IT product as part of an overall IT solution. For example, positioning an SSD or cache as part of a Big Data, virtualization, or Cloud solution. Usually, these solutions relate to trends that get lots of press and analyst attention. There’s nothing wrong with riding the latest wave. It can be great for PR and lead generation. However, sometimes it does not result in as many sales as you might expect. If sales are falling short of expectations, it’s important to understand what could be happening. You may be at the front end of the Hype Cycle. 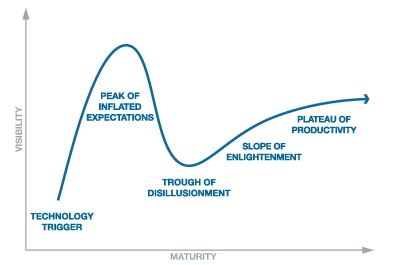 The Gartner Hype Cycle describes a common occurrence in the technology industry. Early proof-of-concept stories and media interest trigger significant publicity for a new technology. The early publicity produces a number of success stories. As a result, IT people start to download white papers and attend events to learn about this latest breakthrough — triggering lots of sales leads. Some early adopters take action, most sales prospects do not. That results in a low conversion rate from market qualified leads (MQLs) to sales qualified leads (SQLs). In this case, I believe that Big Data is somewhere approaching the “Peak of Inflated Expectations.” It’s a promising area, but at this time most people are still figuring out how they would use Big Data — more of a business question than an IT question. They need to figure out where would the data come from and when they have the data, what questions should be asked to turn it into actionable information. Those questions need to be addressed before an organization gets to storing and analyzing data. On the other hand, server and storage virtualization was the new, promising, technology 10 to 15 years ago. Many of the issues have been resolved and that technology is somewhere on the “Slope of Enlightenment” with a large number of real customers for virtualization-related solutions. Misunderstanding the Hype Cycle/new market situation is a huge problem for IT firms, especially start-ups. It frequently results in changes of executive management as the VP of sales and VP of marketing each incorrectly assumes that one or the other is not pulling his/her weight. The sales team wants more leads. The marketers generate more leads. The leads don’t turn into enough deals so something must be wrong. Is it the quality of the leads (marketing is blamed), the quality of the follow-up (sales is blamed) or the product itself (engineering is blamed)? Of course, any of these could be real issues. However, assuming the team is qualified and experienced, and there’s nothing wrong with the product, the problem lie with the market. Put another way, the product is positioned for a young “market” that has a lot of people who are interested in learning, but few actual buyers at its current stage. It’s not just the VP of marketing and VP of sales who suffer by misunderstanding the Hype Cycle (and the Honeymoon Period.) I could name one firm that bet it all and lost (sold at a low valuation) by repositioning their product from an intelligent cache to a Big Data solution, despite good advice to the play the cache position. Obviously, this also hurt the CEO, the VCs, and the entire team. If your product is a critical enabler (must-have, not nice-to-have) then it may be bought as part of the overall solution. However in a new market triggered by a new technology, the early adopters will need some time to figure out what’s really needed to create a working solution. Many of the early “solutions” will fail, resulting in the “Trough of Disillusionment.” As a result, the number of vendors thins out significantly as they fail to sell product and run out of capital. The positioning dilemma is obvious. It’s much easier to get publicity and sales leads when you position your product as part of an exciting new trend. If there is one thing worse than low sales, it’s low sales and no buzz. Buzz matters because editorial and social media coverage ultimately lowers promotion costs and builds brand recognition. A recognized brand is twice as likely to be selected (trusted). However, you have to be pro-active at creating this publicity, especially when repositioning your products. Aberdeen, Amax, Arkologic, Astute Networks, Assurance, Avere Systems, BiTMICRO, BridgeSTOR, Cachebox, Cisco, Condusiv, Coraid, DataCore, DataDirect Networks (DDN), DataON, DDRdrive, Dell, Dot Hill, Echostreams Innovative Solutions, EMC, Enmotus, Fastor, Foremay, Fusion-io, GreenBytes, Hitachi Data Systems, HP, Huawei Symantec, IBM Systems and Technology Group, IceWEB, Infinio, Imation, Intel, iXsystems, JetStor (AC&NC), JBOD, JDV Solutions, Kaminario, Kove, LSI, Marvell, Micron, NetApp, Nimble Storage, Nimbus Data Systems, OCZ, Oracle, Panzura, PernixData, Pivot3, Proximal Data, Pure Storage, QLogic, Qsan, Radian Memory Systems, Reduxio, Renice Technology, Runcore SSD, SanDisk, Scalable Informatics, SeaChange, Skyera, SolidFire, Soligen, Starboard Storage, sTec, StorageQuest, Super Talent, System Fabric Works, Tegile Systems, Tintri, VeloBit, Violin Memory, Virident Systems, WhipTail, and X-IO. Many of the firms that I forgot to add to the initial list were very familiar to me. They were typically 10 to 15 years old and had survived the virtualization “Trough of Disillusionment.” However, to many analysts, journalists, and admittedly myself, they are not perceived to be part of the latest trends. They are perceived by the pundits as HDD RAID suppliers or suppliers of older data management software, even though their products have evolved over many generations to include SSD, intelligent provisioning, real-time de-duplication and caching. That said, I expect they are doing better on the important sales side. Of course, the positioning issues with the pundits could be fixed by a good agency – obviously not one they are using, so I’ll take the opportunity to plug mine — Marketingsage. In general, it’s smart to position your products for a new trend. Besides the publicity advantages, you may be entering the next big market at a time when you can make a real difference. However, there are some strategic implications, particularly for start-ups whose VC funding and the ability to attract talent is based on a new trend approaching the “Peak of Inflated Expectations.” If those firms do not also position their products effectively for more mature markets, or if they are not funded for the long game, then such firms can, and do, fail. Join me and a lively panel of experts, editors, and analysts at what may be the first ever marketing-oriented session for CEOs, CTOs, and marketers at the annual Flash Memory Summit. We will be discussing product differentiation in a growth market in a session called: Differentiate or Die – Marketing Flash-Based Storage Systems on Wednesday, August 14, 9:50-10:50 am. This is an Open Session so you can register for free up until 8/11/13. You can suggest questions and discussion topics using the comment box below or by sending me, David Lamont, an email at blog [at] marketingsage.net. If you’d like to support this topic and enhance your own social media reputation, please click the “Share This” and “Like This” buttons below. Your support is appreciated. I’m chairing what may be the first ever marketing-oriented session at the annual Flash Memory Summit in August 2013. A lively panel of experts, editors, and analysts will be discussing product differentiation in a growth market in a session called: Differentiate or Die – Marketing Flash-Based Storage Systems. So, as part of a primer on product positioning, I thought I’d explain the concept of positioning as it relates specifically to Flash-based products. An earlier post, Competitive Positioning of Flash-Based Products – A Primer for CEOs, CTOs and Marketers, explains that your product’s position is whatever your prospective customer thinks it is, not necessarily what you want it to be. Positioning or repositioning is your attempt to influence that opinion. The post also lists the 5+1 elements of a strong position, and gives an industry relevant example. This post highlights how customer interests change, and therefore positioning must change, as a market matures over time. Understanding this evolution is important because the market for Flash-based products is moving to a new phase. The early customers have bought their first Flash-based products already. Those “innovators” and “early adopters” have demonstrated that there is a compelling case for Flash-based products in the enterprise. Software runs faster with Flash, so fewer servers and licenses need to be purchased to support a growing user base. Users are happier, IT costs and support costs are lower. Very fast IT systems give some organizations a competitive advantage in their market so Flash-based storage is mission critical for high frequency traders, some online retailers and even government agencies (think NSA). Virtual servers lower IT costs, but predictable boot-storms and unpredictable surges in demand for data access can slow the system for all users. Flash-based systems make virtualization work better. Flash-based systems require significantly less space and power than hard drive-based systems, substantially reducing the cost of running a data center. Big Data analytics and structured databases, whether real-time or batch processed, deliver information faster when run on Flash-based systems. A batch process measured in hours can re reduced to minutes or seconds. These tangible dollars-and-cents applications, along with the falling cost of Flash-based products, bring new customers into the market. However, these follow-on customers have different expectations to their predecessors. Innovators (Enthusiasts): These buyers are willing to try new ideas at some risk. They can be very knowledgeable. They like to test new ideas and may not need a complete product or solution, just access to the latest technology. There are very few, very hard to find, buyers in this market and they rarely buy in volume. In most cases, a vendor can win the positioning game at this stage if they are perceived to be a technology leader. For example, first with eMLC Flash, first with an Infiniband interface, etc. Early Adopters (Visionaries): These buyers adopt new products early, but carefully. They seek breakthrough advantages (e.g. High Frequency Trading on the stock market using solid state disks.) They can be respected opinion leaders. They will invest in creating their own complete solution so they may need lots of support. There are few such customers, but when you find one, you often find more in the same industry. These customers are looking for products, so with a little bit of sales and marketing, they may find you. However, many start-ups are mislead by this market and their failure to recognize the situation sows the seeds of their demise. For more, please read: Storage start-ups: What CEOs, VPs and VCs should know about the honeymoon period. In most cases, a vendor can win the positioning game with these visionaries if they are perceived to have the lead with a product feature that’s enables the visionaries to achieve their goals. In this case, that might mean they have the fastest product, or the lowest cost per terabyte product. But it also helps to be perceived as experts in a particular application because customers need help building a solution for their particular situation. Today, that situation often involves databases and virtualization. For those who did not notice, TMS employed Mike Ault, a recognized Oracle Guru to help customers better deploy their SSDs with Oracle databases. TMS (Texas Memory Systems), a 30+ year veteran of the industry and former client of my firm, Marketingsage, was recently acquired by IBM. TMS was very successful in its positioning for early adopters of solid state disks. Although these Early Adopters may not buy many units, they can be very influential on the large “Majority” market that will buy in volume. Early Majority (Pragmatists): These buyers adopt before the average firm, but are rarely leaders. They make deliberate, more considered, decisions and they want references. They have a wait-and-see attitude and like to work with proven solutions and vendors. This is the market phase that drives the high tech industry. Sales grow rapidly because a large number of new customers enter the market. They are buying a new type of product so new vendors do not have to dislodge an entrenched direct competitor (e.g. it’s not like asking a customer to switch their existing brand of backup software). However, these buyers do not want to experiment and they are more risk-averse than earlier buyers, so well known trusted brands often win against the new lesser known brands. In most cases, a vendor can win the positioning game with these pragmatists if they are perceived to have the best product that’s safe to purchase. Late Majority (Conservatives): These buyers are keeping up, but not leading. They prefer simple solutions and look to the established standard. They can be resistant to change and are more risk averse. In most cases, a vendor can win the positioning game with these conservatives if their product is perceived to be an industry standard, plug-and-play, 100% compatible option with a great warranty that’s on sale from their favorite vendor. Laggards (Skeptics): These buyers avoid change and very risk averse. They may only purchase when there is no other choice. They buy like the Conservatives do, but only when they are forced to (remember all those UNIX gurus who wanted no part of a GUI?). Although the real market is not likely to be a nice symmetrical bell curve, and it is hard to know exactly where the market is at, there are indications that we’ve reached the “tipping-point” and the enterprise market is entering the Early Majority phase. In this phase, a large number of new customers enter the market. Of course, as demand grows so does supply and competition. Aberdeen, Amax, Arkologic, Astute Networks, Assurance, Avere Systems, BiTMICRO, BridgeSTOR, Cachebox, Cisco, Condusiv, Coraid, DataDirect Networks (DDN), DataON, DDRdrive, Dell, Dot Hill, Echostreams Innovative Solutions, EMC, Enmotus, Fastor, Foremay, Fusion-io, GreenBytes, Hitachi Data Systems, HP, Huawei Symantec, IBM Systems and Technology Group, IceWEB, Infinio, Imation, Intel, iXsystems, JetStor (AC&NC), JBOD, JDV Solutions, Kaminario, Kove, LSI, Marvell, Micron, NetApp, Nimble Storage, Nimbus Data Systems, OCZ, Oracle, Panzura, PernixData, Pivot3, Proximal Data, Pure Storage, QLogic, Qsan, Radian Memory Systems, Reduxio, Renice Technology, Runcore SSD, SanDisk, Scalable Informatics, SeaChange, Skyera, SolidFire, Soligen, Starboard Storage, sTec, StorageQuest, Super Talent, System Fabric Works, Tegile Systems, Tintri, VeloBit, Violin Memory, Virident Systems, WhipTail, and X-IO. If we wait, most will be gone by the end of the decade. A handful will be gone because they will have won the positioning game with the global players and been acquired so the bigger firm can compete in this market. Unfortunately, most of today’s vendors will just be casualties who could not differentiate themselves in a way that attracted enough customers, or who could not defend their position from competitors claiming the same benefits at a lower cost. What is the time-frame for success or failure with Flash-based products sold to enterprise customers? The answer differs depending on whether you are a major global player or a start-up hoping to be acquired. If the history of the IT industry is a guide, I would say that the global players like EMC, IBM, HP, Dell, and NetApp are just getting started and will play for the next 10+ years. They already have the sales channels, promotion budgets, and customer base in place. They are trusted brands adding a new line of products to complement all the others. However, if the start-ups and JBOF (just a bunch of Flash) vendors are not hearing alarm bells, they are not listening. The strategic acquisitions, where the large players buy smaller firms for their technology (not customer base), are in full swing and there can’t be more than a small handful of healthy buy-outs left to go in this round. To survive with iterative technology innovations (rather than major breakthroughs) the smaller firms need to get their sales and marketing right within 12 to 24 months (4 to 8 quarters, if they are lucky) — at the time of writing in July 2013, that means they win or lose somewhere between 2H14 to 1H15. In most cases “losing” results in a change of senior management and a zombie company hoping for a reboot before having to sell the IP assets at a loss. Opening new sales channels. A reseller (incl. OEMs and service providers) is only going to sell one or two brands. With 3 to 6 months to sign, and 3 to 6 months to sell, you can see why the time to act is now. Resellers mitigate end-users’ risk (very important in the Majority market) because they already have a trusted relationship with their end-user customers. They also supply complementary products and expertise so the end-user gets a complete solution. For the vendor, they deliver quick access into new market segments without the high capital costs of doing it themselves. Build a large prospect list. Email marketing allows you to consistently and frequently promote to named prospects, often prior to their brand-selection decision. It’s relatively low cost and effective. However, it only works when your contacts have subscribed (self-identified and shown an interest in what you have to say). Buying or renting a 3rd-party list won’t do it effectively enough so investment in lead generation is important. Not everyone who shows an interest in learning (e.g. a subscriber downloading a white paper) is ready or able to buy a system costing tens-of-thousands of dollars (or more) so only a small percentage of your marketing-qualified leads will become sales-qualified in any given quarter. Therefore, you need to (properly) nurture that list. The response rate will be a bell curve from “hot” (buy quickly) to “cold” leads (don’t buy), but 6+ months average would not be unusual. As a result, you need to front-load your lead generation efforts to build that list sooner rather than later. It takes months and quarters to get a lead gen. machine humming so if you wait to add the talent (employees or agencies, like Marketingsage) or wait for an inexperienced team/agency to experiment with tactics you will likely run out of time — your revenue won’t equal your capital burn rate so you’ll get weaker and weaker with each passing quarter as competitors become the hard-to-dislodge incumbent suppliers to both resellers and end-users. Build your brand. A typical buyer will only consider 2 or 3 products, not 5 or 60+. If they do not know who you are or what you stand for (i.e. your perceived position as the fastest, best VDI solution, lowest cost, etc.) you will not be considered at all. It’s easy for EMC, HP, Dell, etc. to be recognized and considered, but not so for the other 50+ players. Even if they make it to the small consideration set, the recognized brands are 50% more likely to be selected because familiarity and trust often go hand-in-hand. Branding and positioning are closely related. 1. The market is evolving. The new buyers of Flash-based products are more risk-averse. To win the positioning game you need to convince a high volume of potential customers that you have the best product that’s safe to purchase for their particular needs. In this market, “safe” does not just mean a reliable product. It’s is not just about MLC vs eMLC vs SLC technology or redundant components. A safe purchase is also about proven interoperability (e.g. certifications), ease of integration (e.g. same brand as server), warranties, references (e.g. customer case studies), endorsements (e.g. awards), familiar brands names (e.g. firms they read about in the press, see at events and hear about regularly) and trusted suppliers (e.g. vendors they have experience with). 2. Marketing is more important now. If technology innovation remains iterative (not ground breaking) and quickly matched by competitors, sales channel development and marketing promotions will separate the winners from losers. 3. Time is short. If you are not one of the big global vendors, your time frame for success is very limited (I’m predicting 2H14 to 1H15) for most. In this case, success might mean getting acquired or becoming profitable before the initial capital runs out. Of course, profits come from customers. The early winners have the advantage of revenue, references and incumbency. Join me and a lively panel of experts, editors, and analysts at what may be the first ever marketing-oriented session for CEOs, CTOs, and marketers at the annual Flash Memory Summit in August 2013. We will be discussing product differentiation in a growth market in a session called: Differentiate or Die – Marketing Flash-Based Storage Systems on Wednesday, August 14, 9:50-10:50 am. This is an Open Session so you can register for free up until 8/11/13. I’m chairing what may be the first ever marketing-oriented session at the annual Flash Memory Summit in August 2013. A lively panel of experts, editors, and analysts will be discussing product differentiation in a growth market in a session called: Differentiate or Die – Marketing Flash-Based Storage Systems. So as part of a primer on product positioning I thought I’d explain the concept of positioning. Positioning starts with a product. In this case, products typically include a solid state disk, a Flash-enabled appliance or caching software. However, in marketing, the term “product” can include services, a person, an idea, and a vendor. I’d be hard pressed to name a service, person or idea that should be included in this specific post, but the 75+ vendors competing for the attention of the enterprise buyer with Flash-enabled storage solutions are definitely relevant. I’ll narrow the field to those competing for enterprise buyers. In most cases, the solution is a hardware product that uses Flash memory, but not always. Some vendors develop software products that mitigate the need for additional hardware, essentially fulfilling the same customer need. This June 2013 list includes some newborn vendors (not yet shipping) and some undead vendors (they look dead, but still might bite.) In general, I excluded those selling only hard disk drive form-factor SSDs (e.g Seagate, sTec) and Flash chips (e.g. Toshiba, Samsung), but I included PCIe SSD vendors if they claimed to have a product for enterprise servers. It’s possible that a majority of enterprise storage products are purchased, not because they are the best, but because they are adequate and have a particular vendor’s brand name on them. The vendor’s reputation is an integral part of what’s purchased. That said, position is not so much about the product as it is about how the product is perceived in the mind of the prospective purchaser. Your position is whatever an individual prospect thinks it is, not what you think it is. Your position is relative — worst, worse, good, better, best product for the problem the purchaser is trying to solve. Also, your position can change. Positioning or repositioning is about trying to influence what others think of you and your product. These tasks usually fall under the purview of the Chief Marketing Officer (CMO). But in reality, positioning is one of the most important responsibilities of the Chief Executive Officer (CEO), whether he or she acknowledges that responsibility or not. It’s the CEO’s responsibility because the engineering department does not report to the CMO. That’s a key point, because in the IT industry the founding Chief Technology Officer (CTO) has by far the most influence on a product’s positioning. In most cases, the foundation for a product’s position is set long before a marketer is even hired. To succeed in the positioning game, the product needs to be designed to be the best at something — something that buyers care about enough to pay for. Is valued by the market. Customers have to want it and be willing to pay for it. Can be differentiated from similar products. It has to have a unique valued quality that makes it stand out. Is defensible. Others can’t (credibly) make the same claims. Is promoted consistently and frequently. People can’t buy what they don’t know about. There’s one other factor that is almost always critical to a strong position, especially for those selling enterprise IT products. That factor is: Time. It is possible that a product and company can burst onto the scene and immediately establish a strong position, but when this happens it is definitely an exception. Sorry, but that inaugural press release announcing you as “the leader in …” is just the beginning of a long process that usually requires a great product line, as well as consistency and frequency of communication to the right people, at the right time, through the right channels. In a nutshell: Customers = Innovation x Marketing.™ More realistically, Customers = Innovation x Marketing x Time. Application – Features applicable to Big Data, Cloud, Virtualization, High Frequency Trading, Oracle Databases, etc. Interestingly, price is not always a key factor for Flash-based products. For some industries, performance trumps everything because high performance is critical to their ability to succeed in their own marketplace. Examples include High Frequency Traders and some online retailers. Persistence, reliability and ruggedness are key for many military and industrial applications. However, as the market grows and matures the percentage of one-feature buyers diminishes. For most, a mixture of performance, price and additional features determines who wins the positioning game. I’ll add more about market stages in a later post. “World’s Fastest Storage” — Simple as it may seem, TMS said they made storage products. It’s important to inform people about the type of product you sell. Although I suspect some would disagree with me. Here’s a positioning statement from another firm: “…a global leader in enabling businesses and service providers to transform their operations and deliver IT as a service.” Can you guess what they sell? It’s a big firm. Who are they? If you don’t work there and haven’t looked it up, leave your answer in the comment box below. Performance is the most valued feature for many SSD purchasers, especially those in the early phase of the market. Being the fastest is the best possible position. It’s a differentiated position because no one else can be the fastest. Most importantly, TMS took steps to defend its claimed position. First of all they trademarked the “Makers of the World’s Fastest Storage” phrase and successfully prevented competitors from using it. However, it takes more than trademarking a statement to hold a position in a prospect’s mind. TMS consistently backed up their claim by releasing product after product with record-breaking performance specifications. They backed those specifications up with independent benchmarks and customer testimonials. Additionally, it helped that they were selling high performance products for over 30 years. It takes time and consistency for a position to stick. Although TMS claimed the pole position for those interested in fast storage, it does not mean that everyone was aware of them or accepted their claims. In my biased opinion, TMS punched above its weight but could have done better. Promotional budget aside, a stubborn refusal by the owner to adopt some basic marketing practices left them with a website and trade show booth that made them look out of place alongside the principal suppliers of enterprise IT products. This made it unnecessarily difficult for TMS to convince some of the prospects they reached that they were the success they claimed to be. Cardboard signs: An illustration that the medium matters to the credibility of the message. In general, the message and its delivery should conform to the expectations of the market. I’m chairing what may be the first ever marketing-oriented session at the annual Flash Memory Summit in August 2013. A lively panel of experts, editors, and analysts will be discussing product differentiation in a growth market in a session called: Differentiate or Die – Marketing Flash-Based Storage Systems. So, as part of a primer on product positioning, I thought I’d list the players in the game. In this case, I’ll narrow the field to those competing for enterprise buyers. In most cases, the solution is a hardware product that uses Flash memory, but not always. Some vendors develop software products that mitigate the need for additional hardware, essentially fulfilling the same customer need. As you can see from the list of 75+ (below), there are enough vendors, products, and brands to make any buyer’s head explode. But if they wait, most will be gone by the end of the decade. A handful will be gone because they won the positioning game with the global players and were acquired for big bucks. Most will just be casualties who could not differentiate themselves in a way that attracted enough customers, or who could not defend their position from competitors claiming the same benefits at a lower cost. This June 2013 list (with a July update) includes some newborn vendors (not yet shipping) and some undead vendors (they look dead, but still might bite.) In general, I excluded those selling only hard disk drive form-factor SSDs (e.g Seagate) and Flash chips (e.g. Toshiba, Samsung), but I included PCIe SSD vendors if they claimed to have a product for enterprise servers. If I missed a vendor, please let me know.